One thing I can confidently brag about is that I have made more training mistakes than most people. As I look back over 20 years of training (or what I thought was training), I have learned some valuable lessons. Because of this, I thought I would share some of my dumb mistakes so you can spare yourself the frustration I have had and learn the easy way. One of the huge mistakes I have made an embarrassing number of times is false squat gains. If you are serious about making progress in your performance or appearance, squats can be a great option, but only if you make real squat gains. Most people are smart enough to know that if you want to get better/leaner/bigger, you need to make consistent progression with your training exercises. As a result, I would start a training program with a lighter, full range of motion squat. Then, each subsequent training session I would increase the weight I lifted while simultaneously (and unknowingly/) cutting my squat depth. The end result would be what I thought was a huge increase in strength. However, eventually I would clue in that I was now squatting several feet higher (okay, that was a slight exaggeration) than when I started the program. The thing many people fail to realize with squat mechanics is that each inch cut from the squat depth makes the lift substantially easier. As a result, you get more stress for your spine, but not necessarily your legs. 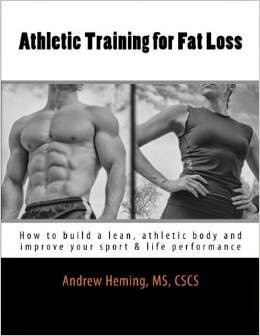 The end results of my false squat gains were always the same: no increase in thigh girth measurements and no increase in performance. The only thing I gained was sore knees, extra spinal compression and a shattered ego when I realized I had wasted another few months of training and had to return to the light weight I started with. 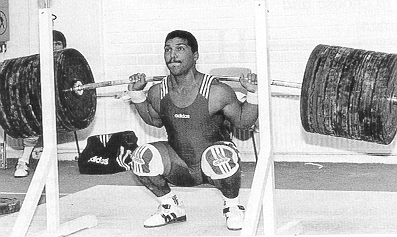 Note: I''ll expand on the importance of proper squat range of motion in future posts. Ensure that you have the mobility and stability to do a proper range of motion squat. With myself and my athletes I define that as the upper thigh breaking (i.e. going just below) parallel with the floor. If you lack mobility and stability, work on it. For example, doing this Squat Stretch may help. If you train with a training partner, have your partner get down at the side and tell you when you hit your bottom depth. Remember, a training partner is not a workout buddy or a cheerleader to make you feel good. A training partner is someone committed to helping you have a productive training session. That means telling you what you need to hear and calling you on a high squat. Film your squats. A while back I watched an excellent interview with Kirk Karwoski - one of the greatest powerlifters of all time. (To give you an example of how strong Captain Kirk was, check out this VIDEO of him doing a thousand pound squat - twice. In competitive Powerlifting, you do a lift just one rep at a time, but Kirk was feeling so strong that he did it twice - just because he had to try. What also impresses me with the lift is that he actually broke parallel each rep and had to walk the weight out himself, and did the first rep like it was 135lbs). One of the gems I gleaned from the interview was the importance of taking video of oneself. Kirk would videotape each training session during his competitive career and then analyze it afterwards. It is amazing what you can learn about your technique from seeing yourself on film. These days with almost everyone having a video feature on their phone, filming is easier than ever. Even if you train without a partner, ask a nice person at the gym to film a set for you or get a little tripod. Bigger Faster Stronger sells beepers that you wear on your thigh while squatting. The device is designed to sense parallel and then beep. I have used them with our athletes and they are okay - not a must-buy product, but they can be helpful for some. The trick is proper placement of the device. If it is in the wrong spot, it can beep too late or too early. Try touch and go box squats. With this method you set a box at the appropriate height and then squat down until you lightly touch the box, then come back up. My hat goes off to anyone striving to lift progressively heavier weight in the gym. Just make sure that you have earned that heavy weight with proper technique and range of motion that does regress while the weight on the bar progresses.